Organize visible storage areas with the Weave collection. These Weave Storage items combine style and function; the trendy look of weave with the convenience, durability and value of plastic to provide a variety of solutions for your living spaces. 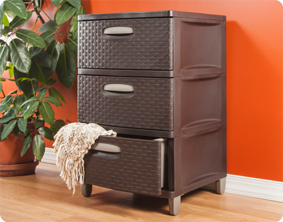 The 3 Weave Drawer Unit is ideal for “out in the open” storage needs, and the included legs give it a furniture-look that will complement all decor. Three opaque drawers keep clutter controlled and concealed while providing access to frequently used items, where they are most often used. 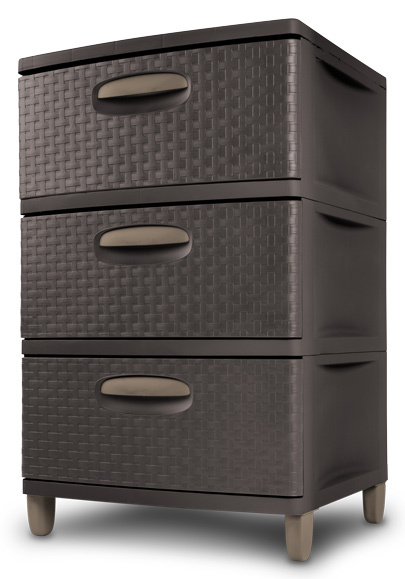 Hidden rollers and wide ergonomic handles allow drawers to open and close easily, even under heavy loads. The overall dimensions for this item are 20" x 19" x 32". Ideal solution for blankets, clothing, towels, and more. The stylish design looks good out in the open! 3 Weave Drawer Unit is rated 4.7 out of 5 by 11. Rated 2 out of 5 by Gabby from beautiful to look however not functional. I have purchased many products from sterilite. Mostly I purchased sterilites products for storage. This product I purchased for my sons dorm room. Sadly it didn’t last 2 weeks. The draws wouldn’t slide open and the lowest draw cracked. overall poor quality and poor construction. Very disappointed. Rated 5 out of 5 by Irish from Great for cloths I have so many T-shirt and I needed more room,so i seen this in Walmart and knew it would work for my T-shirt,and I’m very happy with it. Rated 5 out of 5 by Robbie from great idea from sterilite! Love this 3 drawer chest!. The drawers are large and pull out easily. We are moving to apartment and are using them for night stands. Easy to move and look great. I agree with other review-we need four drawer chest and maybe 5 drawer tower. Other neutral colors would be great so everything matches! I can't move pressed wood or solid wood furniture so these are great for anyone that has to move frequently. Please make more!!! Rated 5 out of 5 by CraftyLady from Review Product Have 2 in my home office and love them! Now looking at the 3 draw wide to reorganize guest/craft room! Rated 5 out of 5 by Nana580 from Item 1626 This is a great product. I highly recommend it. I use this to store cookbooks, appliance user manuals. I also use it to store containers and their lids for storing foods. Rated 5 out of 5 by jwg527 from Best storage EVER Love, Love, Love this product. Bought two to use as side tables for a bedroom. Look nice and the amount of storage is great. It's about time someone updated the design of plastics. Hope to see more and more of this product line. Rated 5 out of 5 by Aja from Nice Product!!! I really love this drawer unit. It really looks like quality furniture. It will definitely look great in the bedroom or the living room as a side table. This is a well made product.